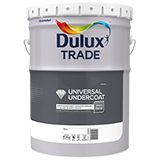 An undercoat for air-drying protective and decorative paints. May be used on primed steel and timber, and on sealed cement, hardboard, composition boarding, and other materials used in the construction industry. Low odour - can be used in odour sensitive areas.